Nine people have been killed in a shooting at the Emanuel African Methodist Episcopal Church in Charleston in the US state of South Carolina, officials say. City police chief Gregory Mullen said eight of the victims were killed inside the historic African-American church on Wednesday evening, while another person died shortly afterwards. Police are now searching for a white male suspect in his 20s. “I do believe it was a hate crime,” Gregory Mullen said. The church’s pastor, state Senator Clementa Pinckney, was among those killed, civil rights activist the Rev Al Sharpton tweeted. A prayer meeting was going on at the time of the shooting at about 21:00 local time on June 17 at the church on Calhoun Street. Speaking at a news briefing later, Gregory Mullen said: “There were eight deceased individuals inside of the church. Two individuals were transported to [the hospital]. One of them has died. “At this point, we have nine victims in this hideous crime that has been committed. A woman who survived the shooting told her family the gunman said he was letting her live so she could report what happened, the Charleston Post and Courier reported. She said the gunman had sat in the church before standing and opening fire, according to an official from the National Association for the Advancement of Colored People (NAACP). 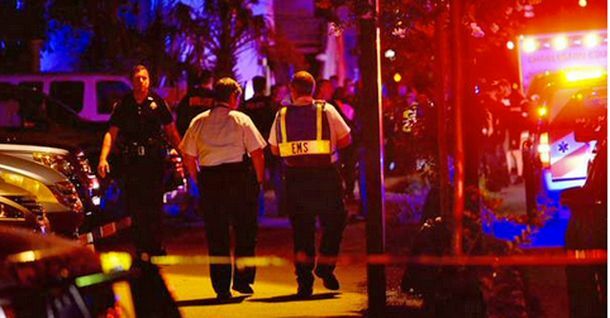 Charleston Mayor Joe Riley described the shooting as “the most unspeakable” tragedy. Jeb Bush’s campaign cancelled an event planned in Charleston for June 18 due to the shooting. “Governor Bush’s thoughts and prayers are with the individuals and families affected by this tragedy,” Jeb Bush’s team said in a statement. Helicopters were seen hovering above the area and a police chaplain was at the scene. At one point police asked residents to move away because of reports of a bomb – but police later gave the all-clear. A group of worshippers was seen praying near the church. The attack comes two months after unarmed black man Walter Scott was shot and killed by a white police officer in North Charleston. The shooting prompted angry protests and highlighted racial tension in the city. The officer has since been charged with murder. Charleston was also due to hold a ceremony on June 18 marking the eighth anniversary of another tragedy – the death of nine firefighters in a blaze at a furniture store in 2007.